Let us know if we have missed one that you would like to see here, or if you spot errors on our part. 90% of zappers currently available are generic 555-based zappers which do not require separate testing since they use the circuit in Dr. Clark’s books. Some 555-based units, such as many of the Parazapper series, “The Ultimate Zapper” and the Terminator zapper series have been specifically included because we continue to get questions about them. Dr. Hulda Clark’s specifications exclude all devices based on the work of Dr. Bob Beck, including his “zapper”/colloidal silver maker/plant growth stimulator, Brain Tuner, “blood purifier”, “blood electrifier” and magnetic pulser. 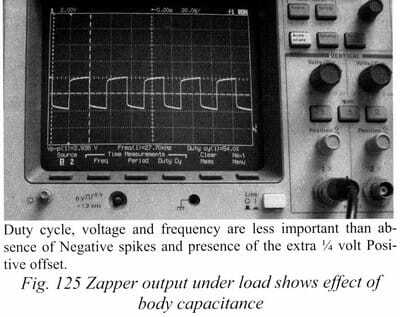 Dr. Hulda Clark’s definition of “zapper” also excludes most “Rife type” devices that I have tested, which generally produce AC output, with negative pulses that can make parasites GROW. See “The Cure for HIV and AIDS,” page 71, third paragraph, for details on the dangers of negative pulses. This is a marketing term used to describe the effects of removing the current-limiting resistance, and is functionally identical to the Super Stabilized Wave (see below). As Dr. Clark demonstrates in “The Cure for HIV and AIDS” the zapper waveform should “round off” under load (ie, while zapping) – however, the “Constant Wave” prevents this natural alteration of the zapper waveform into the ideal waveform, actually reducing effectiveness of the zapper while increasing risk of damage to delicate tissues. Shown here is Dr. Clark’s ideal zapper waveform from “The Cure for HIV and AIDS,” page 514. Superior (Super) Stabilized Wave This is a marketing term invented by the DCRA to describe the removal of a current-limiting stage in the output of the Super Zapper DeLuxe zapper models. This current limiting was intended by Dr. Hulda Clark to prevent tissue damage. Removing it is not a benefit, and was not endorsed or approved by Dr. Clark, who required that her devices be unconditionally safe and effective. Superior Harmonics This is another marketing term which has led some people to believe that harmonics are a desirable feature in a Zapper. It is a claim based on the removal of the current limiting resistance as noted above, producing a sharper waveform on the oscilloscope. Electroporation The idea of using a Zapper for electroporation therapy is uninformed nonsense, as the voltages required (typically 10,000 – 100,000 volts per cm) are far too high for any home use device, much less a safe, effective Zapper designed to Dr. Clark’s specifications. AC Adapter We purposely do not include an AC adapter with our Zappers because the potential for catastrophic failure and electric shock would undo all the good we are accomplishing with the Zapper. DANGER! Both the “The Ultimate Zapper” and the “Zapper Digital” are powered by an external AC power adapter, which can electrocute you when it fails. For this reason Dr. Clark specifically excluded all AC-powered devices from her definition of a zapper. Contact us for further details or to submit/request updated information.